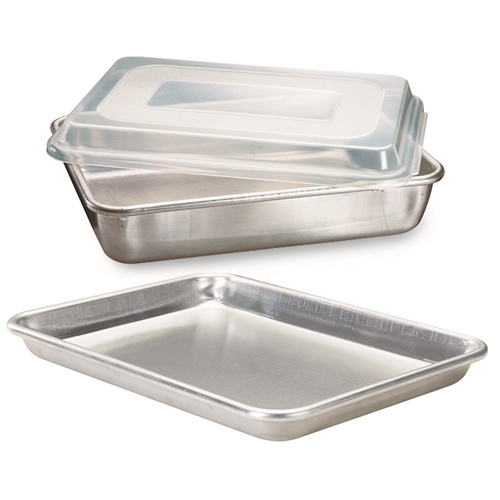 Set contains a 9 x 13 Natural Cake Pan, a 9 x 13 Natural Quarter Sheet Pan and an interchangeable storage lid. 1. Before initial use and after subsequent uses, hand wash with warm, soapy water. Not recommended for dishwasher use, as discoloration will occur but will not affect baking properties. 2. Season pan with a solid or spray vegetable shortening before each baking use or line with parchment paper. 3. Scouring pads and metal utensils may scratch pan, but will not affect baking performance. 4. Aluminum is reactive to the acids in certain foods such as vinegar and tomato products which may darken, pit or corrode the pan. 5. Lid is for storage use only.